Creating stylish and sophisticated environments that are affordable for consumers from all walks of life is the forte of Joe Ruggiero. As one of America’s most trusted design authorities, Ruggiero is well-known for his ability to identify what consumers are looking for and showing them how to create it from both an aesthetic and practical point-of-view. During his thirty-five+ year career, Ruggiero has been a leader in identifying trends and translating them into design ideas that have been embraced by consumers worldwide. 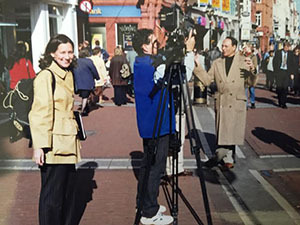 Ruggiero has the unique and extensive experience of working directly with consumers from both a retailing and communications context. As Advertising Director for Westpoint Pepperell, one of the world’s largest home textiles manufacturers, Ruggiero changed the way that consumers thought about home textiles through innovative advertising and sales promotion programs that won accolades throughout the industry. He pioneered the sales promotion video concept that brought bed and bath decorating ideas to the small-screen in ways that consumers found inspiring. 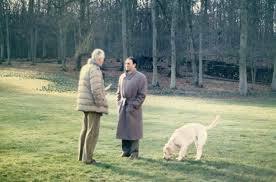 For example, he capitalized on the legendary interest consumers have in celebrities by creating “A Visit to Le Jonchet”, in the country home of French designer Hubert De Givenchy. As a designer for Westpoint, Givenchy’s home was the perfect backdrop for a video to showcase his bedding collections while also providing a glimpse inside his historic chateau filled with some of the world’s most important artwork. Ruggiero spent 15 years at Ethan Allen as director of advertising and creative director; and was a part of the team that created and launched their national TV advertising program (instrumental in their growth from $25 million to $250 million in sales) and their national special events program in 230 Ethan Allen galleries. As a national spokesperson for companies such as Glidden, Ethan Allen and Kohler, Ruggiero created innovative marketing campaigns that broke new ground. For example, during his five years as Kohler’s national spokesperson, Ruggiero coordinated the Kohler “Coordinates” program; a comprehensive marketing program created to aid consumers in kitchen and bath remodeling projects. This was the first program of its’ kind to show consumers how to coordinate home improvement products across product categories; and created a new way for Kohler and its’ 11 participating manufacturers to drive sales and build market share. He also produced/hosted the “Kohler Radio Series”; utilizing the power of a non-traditional medium (radio) to promote their product category in a way unique to their competitors. Kohler is the #1 manufacturer in the world of bath and kitchen fixtures. As Editor-in-Chief and Publishing Director of Hachette’s Home Magazine, Ruggiero was given the challenge to re-energize a national magazine that had suffered tremendous market share loss. The result? He created a “new” magazine that then became a major force in the home decorating/renovation publishing field. Equally important, he tapped into the minds of consumers nationwide; and interacted with them during retail special events–furthering his study into what consumers are looking for. Ruggiero then formed Joseph Ruggiero & Associates, Inc. an independent multi-media company that specializes in home design television production. This step created the opportunity for him to work in multi-media, retail and manufacturing; and in sales marketing. 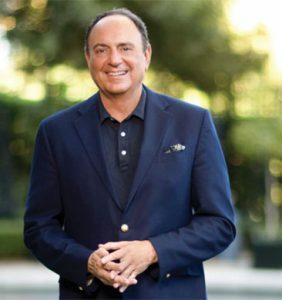 Then as host and producer of multiple home design television series and specials aired world-wide on The Home & Garden Television Network (HGTV); Ruggiero’s work has been welcomed into the homes of 84 million households on a daily basis for 14 years. Currently he is in development on a new design series for PBS. Ruggiero is also known for his nationwide “IdeaHouses.” The “IdeaHouses” received substantial press nationwide and have been lauded for their innovative design direction. Hundreds of thousands of consumers have visited the showhouses for a seven year period in Los Angeles, San Francisco, Seattle, Dallas and Houston. 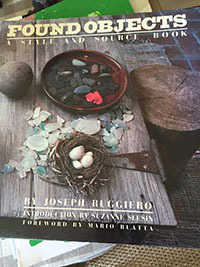 Ruggiero has been a multi-media design authority figure to consumers for many years. He is most noted for bringing the subject of home design to network television. 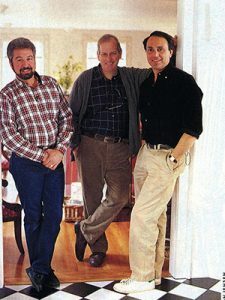 For nine years, he was Chief Design Consultant to the PBS award-winning series, “This Old House”, where he designed and decorated nine houses for the program. He also spent two years as Design Correspondent on ABC-TV’s “Good Morning, America.” Ruggiero has hosted and edited a variety of television vehicles such as “The Living Magazine” sponsored by Ethan Allen for the Lifetime Cable Network; and ABC-TV’s “Home Show” where he produced, designed and hosted segments featuring decorating and remodeling of three houses in a weekly mini-series format. He is author of the design and source book, “Found Objects”, published by Clarkson N. Potter; and was the recipient of the International Furnishings and Design Association (IFDA) “Star of the Year” award in 1995. 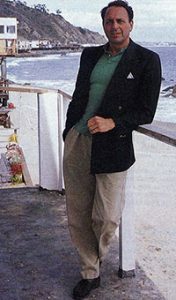 His blog: joeruggiero.blogspot.com, is receiving rave reviews. You can also follow him on facebook, Twitter and his website: joeruggiero.com. Ruggiero’s multi-media work has created a familiarity with millions of consumers who have, and continue to, welcome him into their homes. He is a well-known credible source of design inspiration; a familiar face that consumers trust to guide them through the decorating stages of their lives. Ruggiero is a rare presence in the world of design, combining outstanding design talent with a high multi-media presence. In the year 2000, Ruggiero launched his Home Collection. Currently he designs for: Miles Talbott, Upholstery; Gat Creek, Wood Furniture; Sunbrella, Textiles; Wildwood Lamps, Lighting; Decorative Sunbrella Throws, Textillery Weavers; Phoenix Decorative Trims with Sunbrella yarns; Outdoor Furniture, Terra and Woodard. Ruggiero’s home furnishings designs have received accolades from the design profession, indluding the American Society of Furniture Designers, Pinnacle Award, The American Furniture Award for outstanding achievement in furniture design and Adex Platinum Award for Textile design. His showroom aslo received the best “Design Appeal” award from the High Point Market Association. He was awarded the prestigious “Trailblazer Award” by the International Furnishings and Design Association.